Seven-year old superhero fan Alex was dealt a bad hand being born with a partially developed right arm. 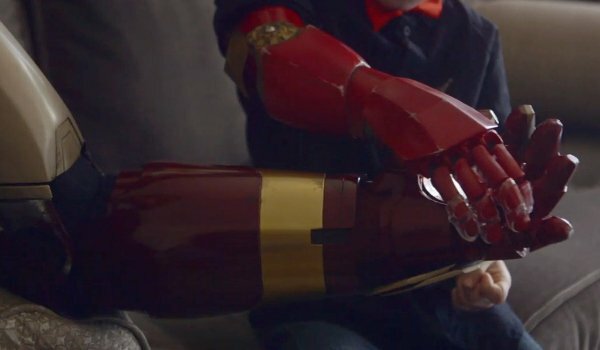 Fortunately, he just received one of the coolest gifts in the world: a prosthetic arm made to look like Marvel superhero Iron Man’s arm. And who better to have given it to him than Iron Man himself, Mr. Robert Downey Jr! Check out the video of the meeting below. Downey tweeted out the video early Thursday for the world to see. When Albert Manero, a student of The Collective Project who founded the volunteer group Limbitless Solutions, heard about Alex, he worked with a bionics expert to create a 3D printed arm to give to the boy at no charge. Upon completion of the arm, Albert brought Alex to meet Downey at a hotel. The actor seemed to be maintaining his Tony Stark persona while talking to Alex, dryly complimenting him on his bow tie and asking how his travels went. However, he immediately broke character and smiled when Alex later called him Iron Man and soon after "Robert." Downey and Alex soon sat in front of two big silver cases, each containing an Iron Man arm (hats off to Albert and the team who made this happen by imprinting the boxes with the Stark Industries logo). The boy commented that both look the same, and the actor suggested they both try them on. While Downey’s arm is simply a movie prop with a faulty light, Alex’s arm is a functioning bionic limb with moving fingers. There’s still some work to be done perfecting the arm, but it’s still an impressive engineering triumph, and also affordable. Downey even joked that as Tony Stark, he might start farming out some of his work to Albert so he can cut down the price of one of the Iron Man suits from $1 billion to half that amount. This Iron Man bionic arm is one of several geek-themed prosthesis that came been created within the past year. Two prosthetic hands were created for two boys last year by E-Nable made to look like Iron Man and Wolverine, the latter of which of course had claws attached. There was also a boy who received an arm decorated to look like a clone trooper from the Star Wars prequel trilogy. Presenting Alex’s arm is another fine example of Downey assisting out with good causes. A little over a week ago he appeared in a video announcing the chance for people to hang out with him for a day if they donate at least $10 to the charity Julia’s House over at Omaze.com. Not only is this classy on his part, but an excellent reminder of how well-known actors can use their fame to help others and be heroes in a meaningful way. Downey will reprise Tony Stark on May 1 for Avengers: Age of Ultron.